Like many small communities facing hard times, everyone got together and worked hard to get things back to normal. 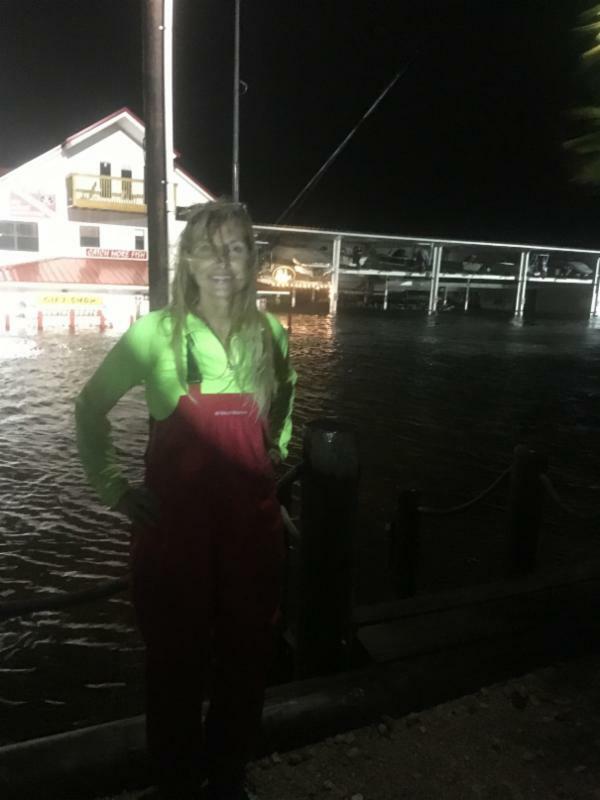 The storm hit Thursday night, and in spite of huge boats in the road and 3 feet of water inside the Ship’s Store, the marina was back launching boats and open for business on Saturday. So many wonderful people to thank that we don’t have room in this report but we appreciate everyone’s prayers and efforts. 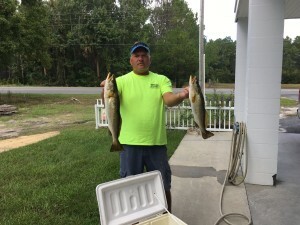 In spite of the amount of water, people continued to scallop within a few days, finding limits south near the Pepperfish Keys, and limits were taken right up through the last day, September 24th. I have been out several times since the storm. As expected, the water is heavily stained inshore and out several miles, and there is a lot of floating grass near shore. Unfortunately the temperatures have remained very high and at the end of the month the water temperature was still 80 degrees. That has not bothered the baitfish; shorelines were full of small and large mullet, whitebait and pinfish and there were pods of migrating whitebait offshore, with Spanish mackerel following them. We found lots of borderline legal trout mixed with some very nice ones. 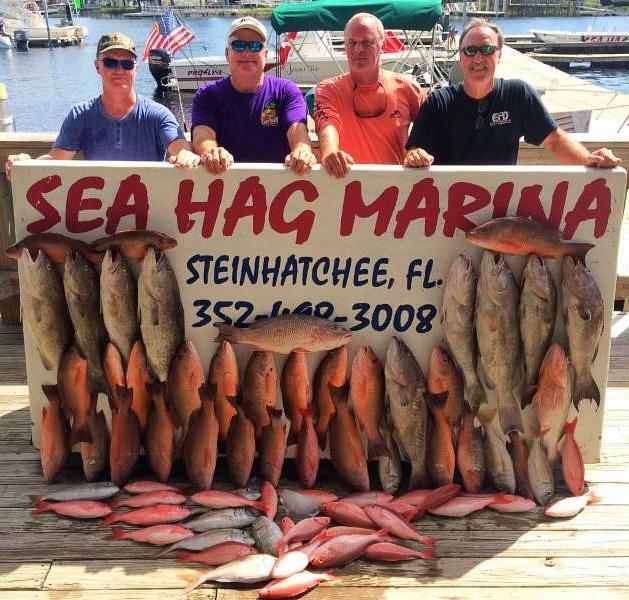 Redfish have begun schooling and have been harder to find. We caught some nice flounder off the sand bars, specifically 9 Mile Bank. Offshore, some kingfish are moving through now, and there are plenty of red grouper, but most have been taken spearfishing or out beyond 80 feet. 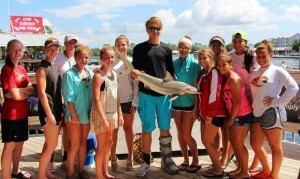 Small cobia have been added to the mix, also beginning their southward migration. Here are some pics from this past month. 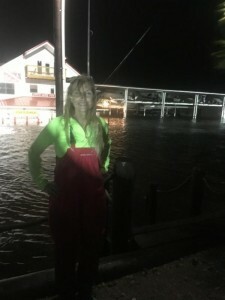 Boss Sea Hag Danielle Norwood standing across the street, showing the water level at the height of the storm surge. 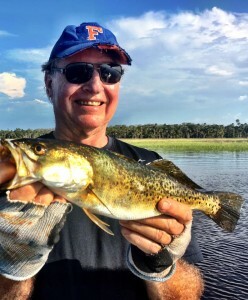 My friend Jack Nettles with a 16 incher….the usual size right now. 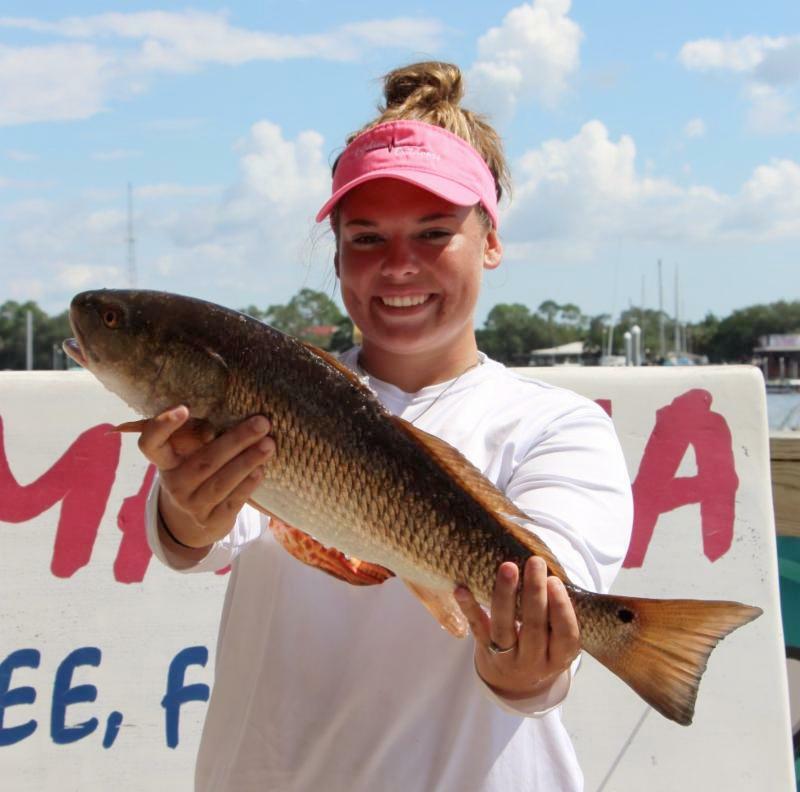 Maddy Fletcher with a beautiful redfish. 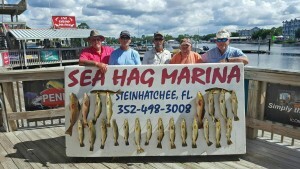 Frank Sheffield and Dean Baker and friends made this haul on a middle grounds trip. 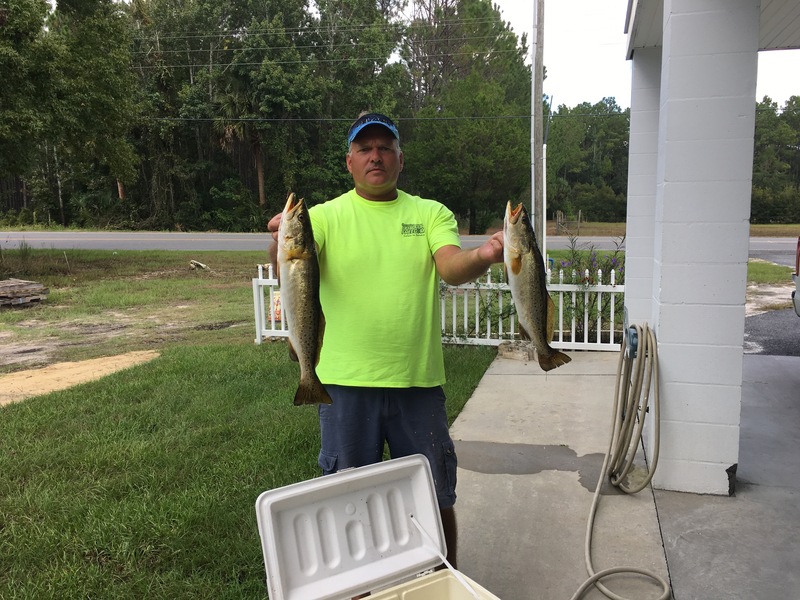 David Chapman found these nice gator trout south of the river fishing topwater plugs. The annual fund-raising tournament for the Santa Fe Lady Raiders softball team was a huge success, and they donated some of the funds back to Steinhatchee relief. One of the Lady Raiders nailed this excellent redfish. Luke Matthews has taken up flyfishing the flooded shorelines with great success. The water will continue to clear with decreasing rainfall as the temperatures cool. 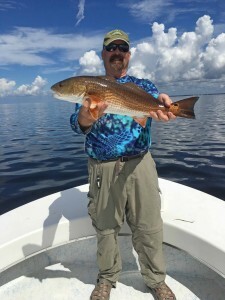 The bite inshore will pick up when the water temp gets closer to the low 70’s. The floating grass will gradually disappear. October, especially near the end of the month, is one of the best times to fish our area. 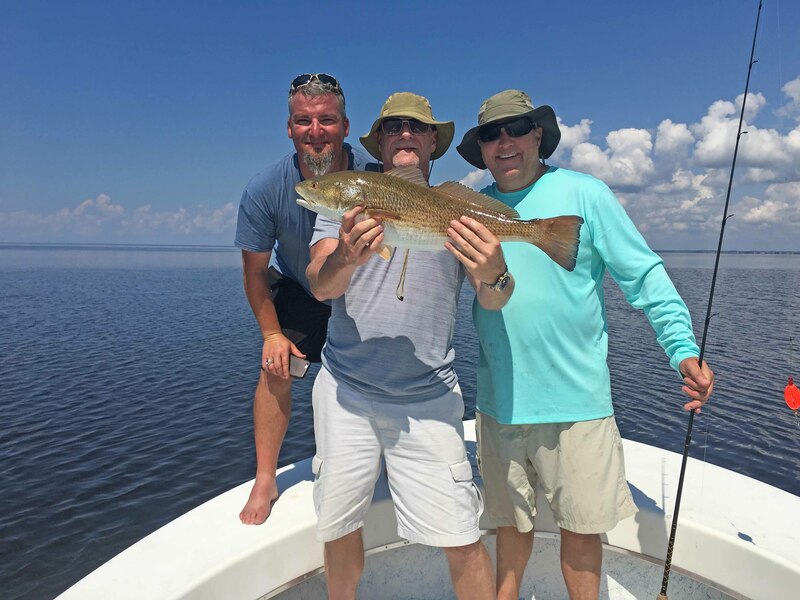 Redfish will be schooling and not that hard to find, and larger trout will begin roaming the shorelines early in the morning looking for food, and retreating as the sun rises. Work toward the shorelines very quietly in early mornings and if possible, fish topwaters or suspending plugs. Look slightly offshore for possible schools of redfish and approach them very quietly. 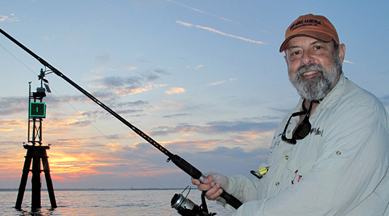 Inshore fishing should be excellent by the end of the month. 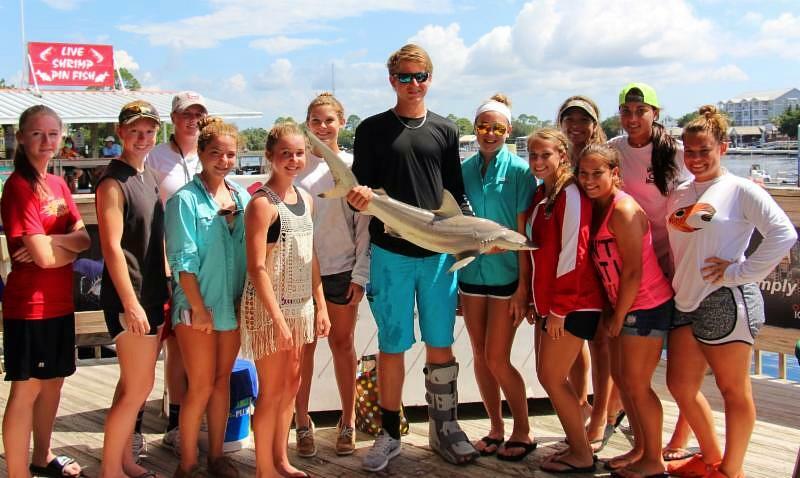 Offshore, look for the pelagic species, kingfish, Spanish mackerel and cobia, to be taken in larger numbers. Near and offshore structure is a great place to fish for all of these. 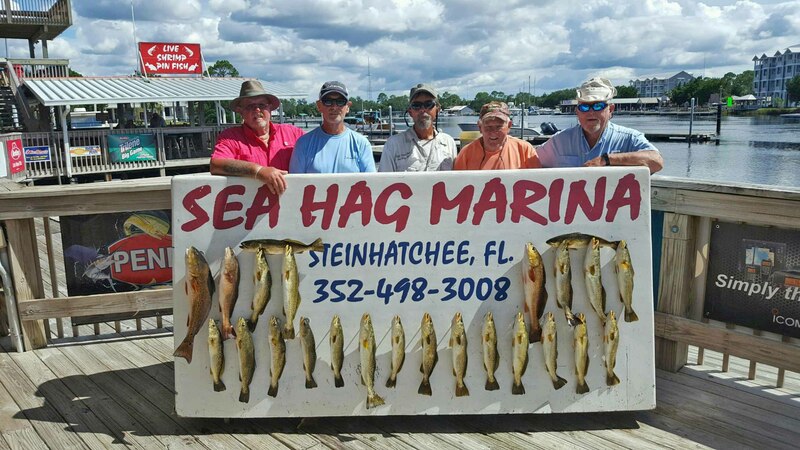 Steinhatchee Reef is always a decent place to start, trolling spoons or jigs through bait schools or anchoring on structure with live bait on the top for kings and on the bottom for cobia. Gag and red grouper are available, although amberjack are in closed season until the first of the year. 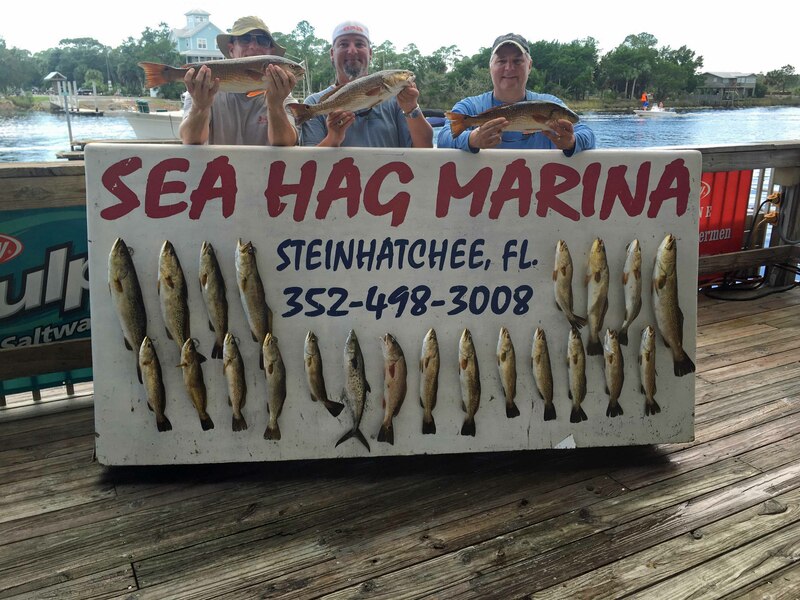 Although most people consider them an inshore species, some of the biggest flounder of the year are taken in the sand around offshore structure, so don’t hesitate to throw down a shrimp on the bottom if you can get it past the black sea bass and Florida snapper. The Ship’s Store is up and running full steam, and the rental boats are available for this great month of fishing. Take advantage of the cooler temperatures and more relaxed atmosphere. Go fishing! 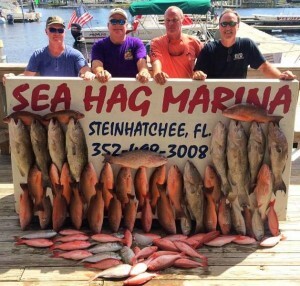 Inshore fishing was red hot in September. All the rain kept the water cool and the sand trout hung around longer than usual. Now with cooler nights expect the fishing to get even better. The redfish are also showing up in the deeper shallows.